The aerospace sector is required to meet extreme high quality standards coupled with unpredictable demand, lumpy orders and pressure on pricing. Aerospace manufacturing in defence is even higher, as it has only one ultimate client per country, Ministry of Defence. 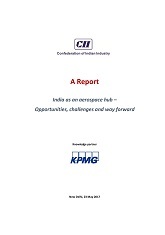 This report, prepared by CII and its knowledge partner - KPMG, explores the possibilities of the aerospace manufacturing sector in India emerging as one of its sunshine sectors. It says that the aerospace sector is at the infection point, similar to the telecom and automotive sector two or three decades ago. Therefore, sustained government support to develop critical mass, skill and a significant amount of R&D is required to achieve its full potential. This report was published at the CII – IAF Seminar On Make In India For Indian Air Force held on 23 May 2017 at New Delhi.